The Baddie: SPECTRE’s Number 2 Emilio Largo and his frickin sharks. Even though I am posting this review about midnight on day 2, this was in fact my breakfast film for the day. 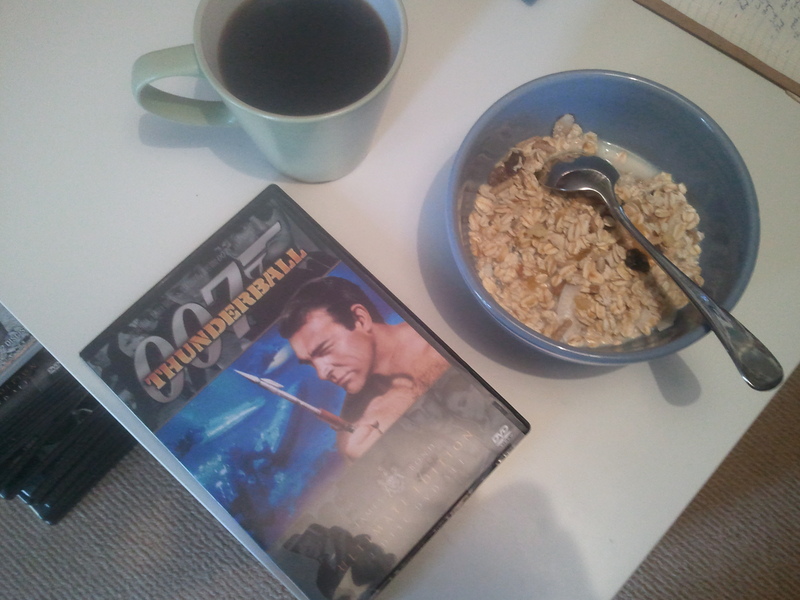 Strong black coffee, muesli and Bond. Often when Bond films start with a really absurd prologue, they stay rather absurd and a little rubbish. 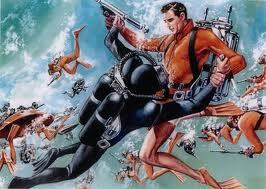 Thunderball bucks this trend though. The prologue features a funeral, cross dressing and a jetpack of course. It also features a cracking fight scene which sets the tone for the rest of the film in my opinion. Previous viewings of this film had left me feeling a little underwhelmed, with the extensive underwater sequences in particular not impressing me. However this time around, my thoughts are very much different. I really do love seeing the continued presence of the SPECTRE organisation as Bond’s villainous foil. Especially the gradual building of Blofeld as arch villain, with the obscuring of his face continuing throughout this film. Also continuing are the organisation’s bizarrely low percentage assassination methods that they attempt to bring to bear on Mr Bond. This time it is not the deadly spider of Dr No, rather death by spinal stretching machine. As absurd as both of these are, it has to be said that both of these sequences are shot with aplomb and a whole lot of tension. The opening half an hour odd of this film is really something else. Bond faces off with a number of different foes in a health retreat as the main plot gradually reveals itself. SPECTRE this time are inserting themselves into the business of NATO, flogging an entire fighter jet along with the two atomic weapons onboard. Their plan is to hold NATO to ransom, demanding 100 million pounds in exchange for the two nukes. SPECTRE’s number 2 Emilio Largo makes a great villain in this film. The character has an inherent theatricality, with his eye patch and mannerisms, which fits the film well. Whilst there are no really standout henchman to support him, Largo does have a frickin pool with frickin killer sharks in it. He puts it to fantastic use throughout the film too. The underwater sequences that I mentioned at the start of this review actually work fantastically well and are deployed in a number of different ways. There is something almost hypnotic about watching the wordless action taking place as SPECTRE’s finest camouflage a jet under the sea. Likewise the beautiful violence of the repeated underwater fight scenes which should be slow and unwieldy but are actually intriguing and suspenseful is a rare treat to behold. Especially cool is a large scale showdown at the end, a good old fashioned gunfight with spear guns. It is quite the effort to make underwater fight scenes actually look believable, but this film achieves it. Along with these fantastic underwater scenes, Connery continues to show just how adept he is at the land based combat too. The raw physicality of the hand to hand combat scenes is great, avoiding the attempts of later films to make it look too over the top. Overall the film is an evolution rather than a revolution. What I mean by that is that it is not reinventing the wheel for the series; rather it is just taking what has already been laid down and improving on it. A great case in point is the ‘ticking clock’ structure which works well at heightening the tension and also differentiating the film from the first three in the series, as Bond and friends race desperately to save the day. In my review of Goldfinger, I suggested my doubts about whether or not it would be topped as my favourite Bond film. Well it has been, very quickly too. 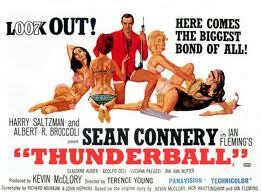 Goldfinger has a special place in my heart, but if I am honest, I think that Thunderball is the superior film. Whichever way you put them, they are probably the greatest back to back features of the series. The underwater sequences, which I thought did not work on previous viewings, really are a point of difference for the film and elevate it above anything that the series has produced thus far.